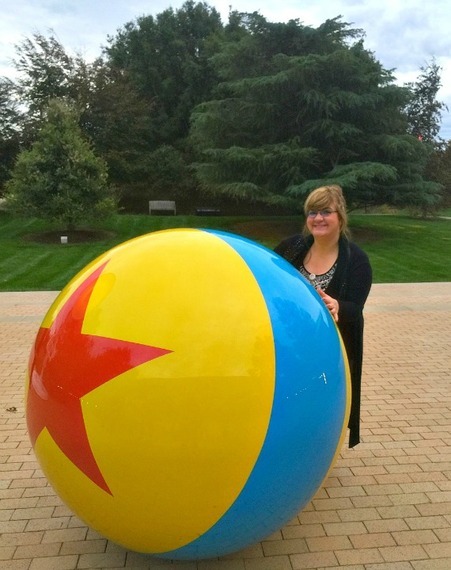 Disney-Pixar provided me with an all-expense paid trip to Pixar Animation Studios for the #GoodDinoEvent. All opinions are my own. The Golden Gate Bridge is an icon that represents California and the Bay Area, but across the Bay and the Oakland Bay Bridge is a town called Emeryville, home of the infamous animation studio, Pixar. A studio where the names John Lassetter, Andrew Stanton and Pete Docter are synonymous with Walt Disney, a studio that brings fantastic storytelling to animation. 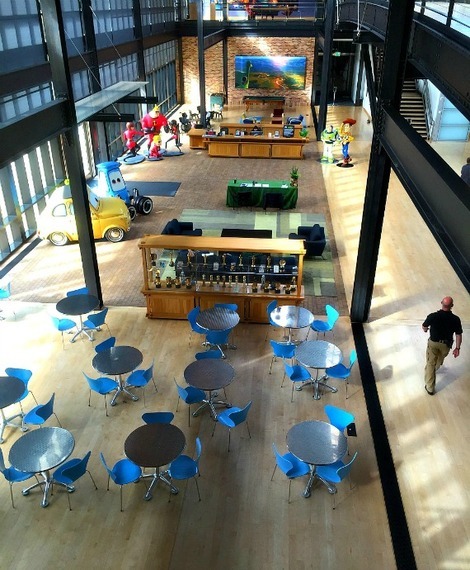 Unlike other studios, Pixar is not open to the public. 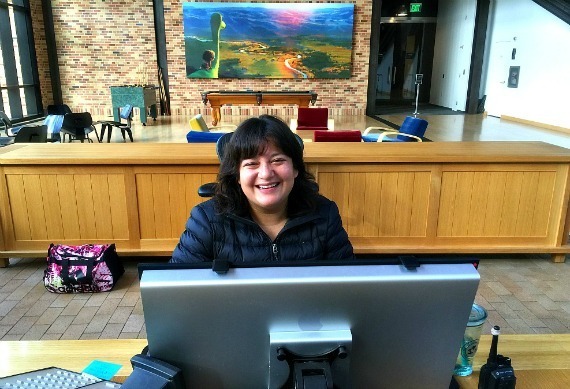 I was so fortunate to visit Pixar for The Good Dinosaur Event during a Disney-Pixar press junket. The very place world-class animators, genius technical artists, incredible imaginative directors, and superheroes of other teams that create, animate and tell the best stories. As we drove into the Pixar neighborhood, much of it was a reflection of Pixar films; I realized the sometimes great inspiration comes from our surroundings. Pixar transforms the ordinary into extraordinary. We stepped off the shuttle onto the 22-acre campus and walked a long, wide walkway, shaded by perfectly placed trees on each side. The walkway opens up to a beige brick patio where the infamous Pixar lamp, Luxo Jr., and Luxo Ball welcome all to Pixar. 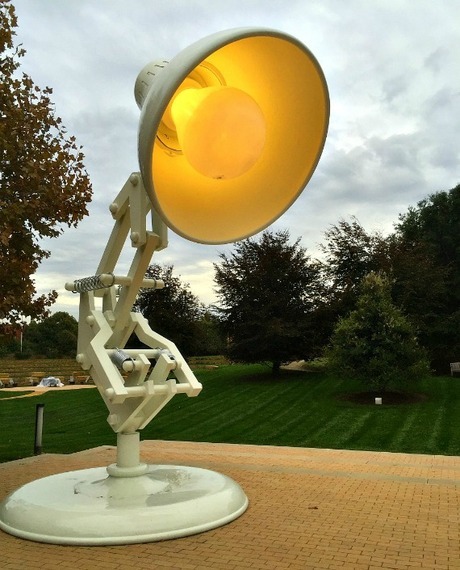 Luxo Jr. has appeared before and after every feature film (except the original Toy Story, where he only appears AFTER the film). These are two of Pixar’s earliest icons and included in Pixar’s corporate logo. Behind Luxo Jr. and the Ball to the left is a 600-seat amphitheater; to the right a soccer field. 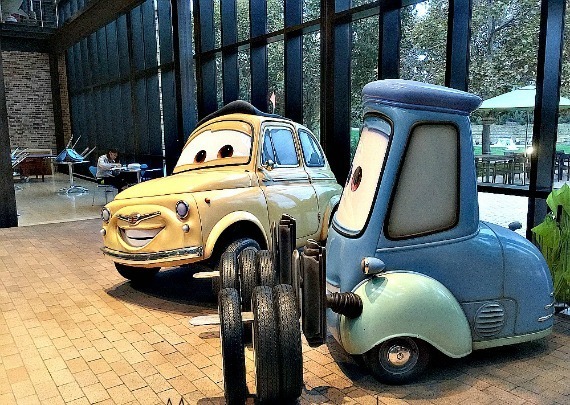 They due, created by John Lasseter, for the Luxo Jr. short film in 1986. 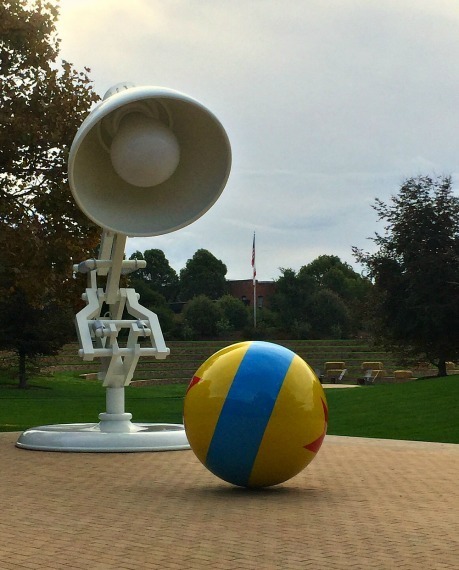 Luxo Jr. and the Luxo Ball are in front of The Steve Jobs building, named for the previous head of Pixar, after his death in 2011. Steve Jobs bought Pixar from LucasArts in 1986 and served as Chairman and CEO until Disney bought Pixar in 2006. Fun Fact: When Steve Jobs purchased LucasArts Computer Graphics Division from George Lucas in 1986, there were only 44 employees. This is the CORE of the campus. It’s the original building that started the campus. The building was originally a candy factory and transformed through design by Bohlin Cywinski Jackson. You’ve probably seen this building in some way through Pixar films extras on Blu-Ray or DVD. I’m going just to say; it is incredible being here. Fun Fact: The building was funded by the proceeds from Disney-Pixar’s A Bug’s Life. Stepping into The Steve Jobs Building made Steve Jobs larger than life for me. It encompasses his ingenuity. Jobs handpicked everything in this building. Fun Fact: The building where Pixar Animation Studios is, took as long to create as a Pixar movie (4-5 years)! In the picture below, notice the brick. Steve Jobs loved the look and color and requested the same brick was used on the Hills Brothers building in San Francisco be incorporated into Pixar. Fun Fact: The brick is now an established pattern. 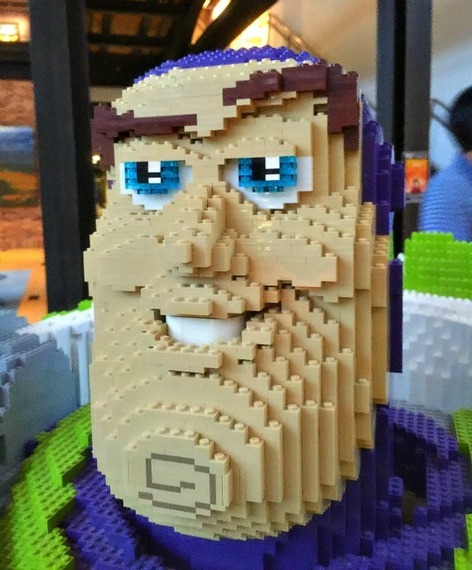 You can even purchase it, ask for it by its name: “Pixar Brick”. The building is like a brain. The left side is home to the tools and computers while the right side is the more creative animation, art and acting take place. 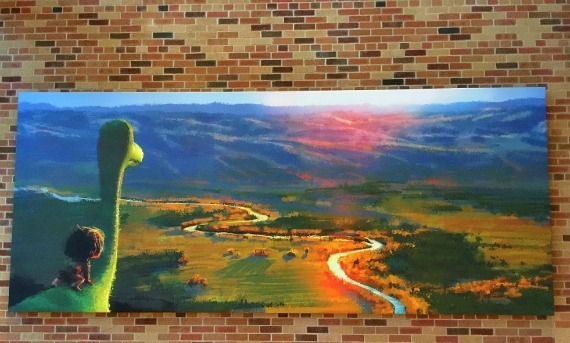 Throughout Pixar, there are enormous canvases of original employee art from Pixar’s short films and features. 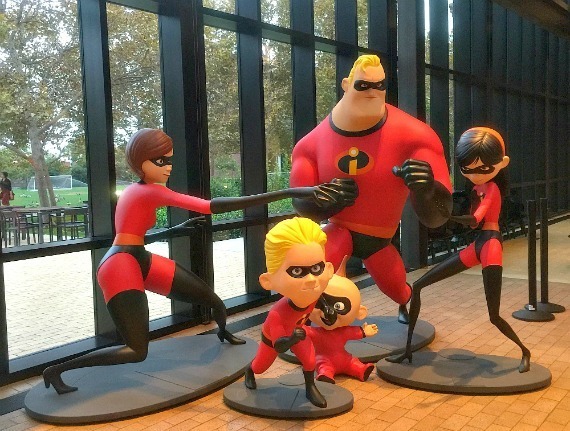 Greeting visitors are life-sized The Incredibles. 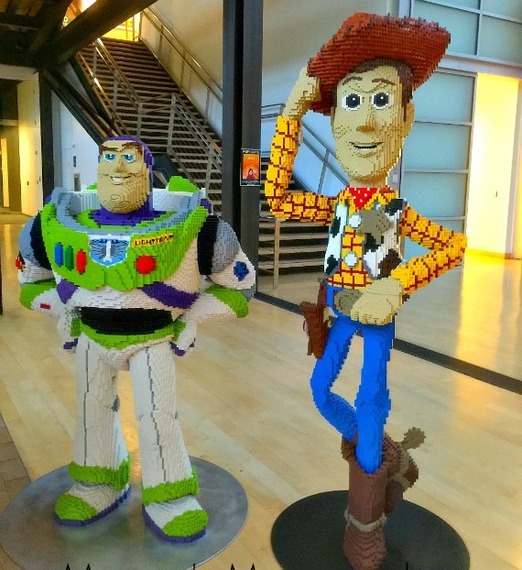 Should The Incredibles need to be called out on an incredible mission, there are also six-foot sculptures of Toy Story‘s Woody and Buzz, built from LEGO. Even Buzz’s name tag is spelled out with LEGO! 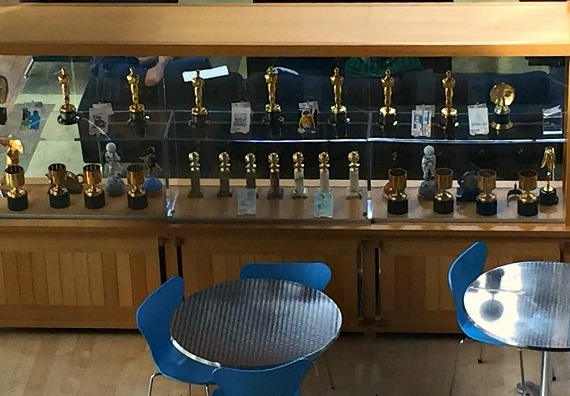 And across the room, an impressive awards cabinet holds all the awards and accolades received by Pixar. Some of my favorites: Best Animated Feature Film for Ratatouille, WALL-E, UP and Toy Story 3. The lobby opens up into what they call the “Atrium,” a mixture of steel and brick for an industrial feel. There is a natural light that makes the Atrium bright and happy. 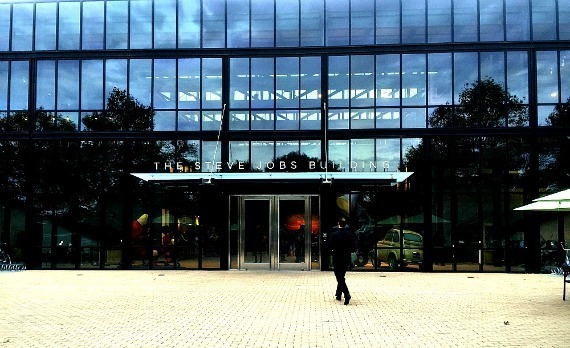 Steve Jobs envisioned the Atrium as a casual gathering place. An area where you could have “chance meetings” and engage in organic conversation. When I heard this, I thought it was a novel idea…and shortly after, we saw John Lasseter walk through the door. On our last day, we bumped into Sanjay Patel, the creator of Sanjay’s Superteam short film. To encourage those “chance meetings,” the Atrium’s main floor is home to the building’s only restrooms, a cafeteria, Pixar Shop, mailroom, cafeteria, cereal bar and plenty of lounging areas. Fun Fact: Concepts and Ideas for Pixar films are always taken “in-house”. Huge windows overlooking the Atrium are glass-walled executive meeting rooms–where movies are imagined and transformed into reality. Inside the Atrium, a community flourishes with a Pixar store, a mail room with wooden cubbies. If you own Toy Story 3, you may have seen the bonus feature named “Pixar’s Cereal Bar“…Pete Docter and his friends discuss the importance of cereal during the workday through animated representations of how the Pixar Cereal Bar fuels creative minds? Cereal from Froot Loops to Museli. There are Frosted Flakes and in the metal pot on the right — oatmeal. This room also has a refrigerator with milk and baskets of fresh fruit! 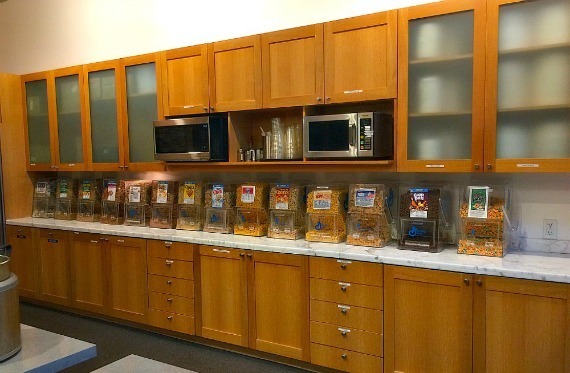 Fun Fact: The most popular cereal at Pixar’s Cereal Bar is Raisin Bran. 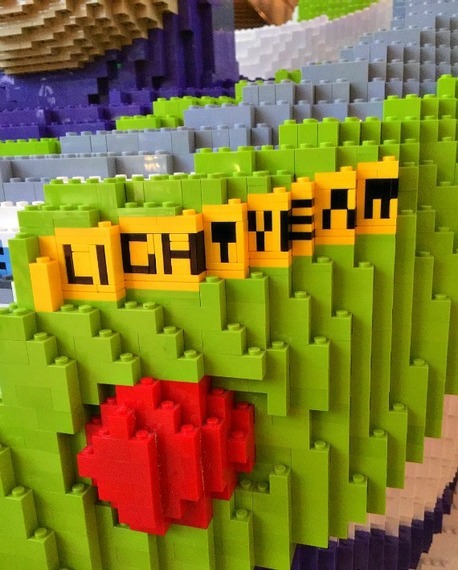 Creativity is everywhere at Pixar. It’s not reserved for any group in particular. In the center of the Atrium is Cafe Luxo, the cafeteria, and it is a prime example of creativity being everywhere. It looks modest with metal counters, but when you see the food, you recognize that the chefs are incredibly creative. Cafe Luxo is the main dining spot and which includes a wood-fired pizza oven, a burrito bar, daily specials, and free fountain drinks. 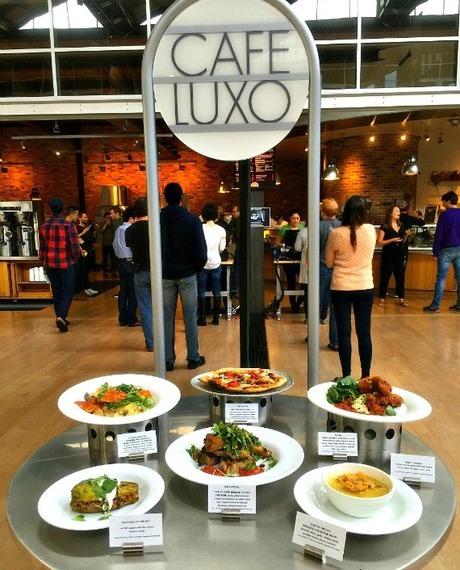 Fun Fact: On average, Café Luxo offers four specials. They also serve San Francisco native’s PEETS coffee. If you leave The Steve Jobs Building and turn right on the sidewalk, you’ll pass tennis courts, gardens, a swimming pool and enter the Brooklyn Building. 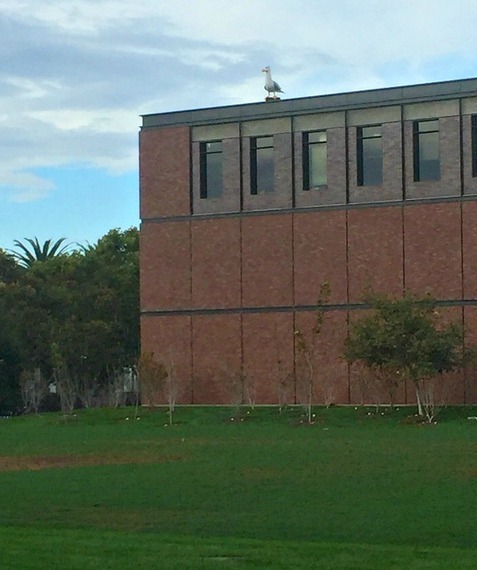 It’s the newest building on campus and features a Seagull from Finding Nemo on its roof. Fun Fact: Pixar Animation Studios campus is New-York-themed with areas named Brooklyn, SOHO, West Village, Uptown and more — It’s all because of the studio’s Park Avenue address! T he Brooklyn Building is 155,000 square feet. It’s a concrete frame and masonry shell building with large, open gathering spaces. Fun Fact: Throughout the Brooklyn Building there are hidden Pixar character silhouettes dotted about the floor! Fun Fact: Behind the fireplace, in the Brooklyn Building, there is a baseball inspired room that was originally an exclusive area for senior employees. It’s named the Jimmy Claxton Lounge, after the first black man to play organized baseball with whites in the 20th century also the star player of the Oakland Oaks. The campus also has a salt-water pool, basketball court, tennis court, gym, soccer field and more. Upstairs in the Steve Jobs Building, the halls seem empty at first glance, but as you approach and walk through them, you are submerged into one of the most amazing art galleries. The gallery changes, based on the film set to release. It hosts conceptual drawings, models, artwork. Pixar is a community of brilliance, but the brilliance shines brighter as those on the ground level, the animators, the story tellers, all interact with one another in this amazing place in Emeryville, California known as Pixar Animation Studios.